If you’re the kind of person who loves chocolate (or fill in the blank with your favorite treat), but bans it whenever you’re trying to lose weight, you might be making a big mistake. As a nutritionist who’s helped hundreds of people lose weight, I’ve noticed time and again that when people try to be “too good” they’re most likely to fall off the weight-loss wagon. Dieting isn’t about depriving yourself of everything you love—it’s just about eating fewer calories than you’re burning (calculate your daily calorie goal here)—a situation that can indeed be delicious. And a situation that most certainly can include dessert. The key is to just make room for the calories by passing on something else. Try these 3 dessert recipes below, all of which have less than 150 calories! (For more delicious diet-friendly treats, check out EatingWell 500-Calorie Dinners, which gives you recipes for satisfying, 500-calorie meals, with dessert—or a glass of wine, if you’d prefer). 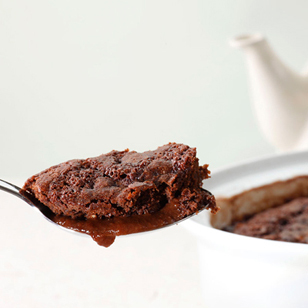 Hot Fudge Pudding Cake (142 calories, 4 g fat): This dense fudgy dessert feels truly indulgent. Mocha lovers will like that this recipe calls for hot coffee, but you can also make it with hot water. Baby Tiramisu (107 calories, 2 g fat): This low-cal version of the classic Italian favorite is super-easy to make—and, thanks to nonfat ricotta, provides a little bit of feel-full protein to boot.